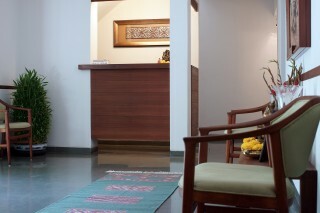 If you are looking to spend some time in Ahmedabad with a small family or group of friends and are looking for accommodation that is homely yet gives you an experience to remember, this is a good option! The home on offer here is aesthetically decorated. 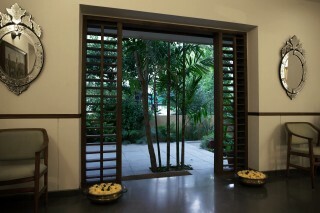 You are greeted with a profusion of garden palms and earthen and brass urns with floating flowers. Inside, the living room is minimally done up, with well-upholstered armchairs, and an attractive rug with a geometric pattern. Pretty art deco mirrors adorn the walls and add a touch of elegance to the space. The bedrooms are spacious, each furnished with a plush four-poster canopy bed dressed in translucent sheers, creating a surreal ambience. Tall brass bedside lamps add ambient lighting and also make it easier for you to read in bed. The en suite bathroom is modern and well-tiled; essential toiletries and bath linen are provided. A sitting area just outside the room is furnished with well-stuffed couches, where you can sink in and watch your favourite TV shows. You can dine al fresco, cocooned in a host of green plants and shrubbery, bringing you close to nature! located on the West side of the city in a quiet and safe suburb.1 km from the city center and /10 minutes drive from the airport/5 Km from the Railway station ,0.25 Km from Night Textile Market . close to important places like IIM/NID/Gandhi ashram etc. Bus stop is 2 minutes walk and there are lots of bus options using this stop. Every room is attached to a private Garden. Government certified. 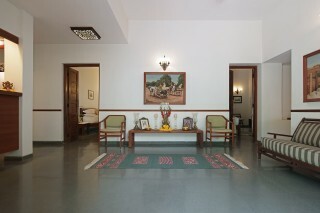 The Rooms are attached to private garden. 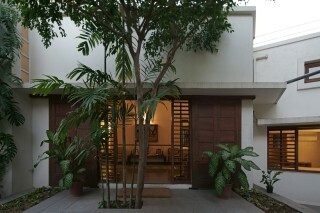 The House is very centrally located yet,tucked in a very peaceful and tranquil corner . The highlight of the place is the visit to the very famous and beautiful Step wells - Rani Ki vav and Adalaj the only of its kind in the country ,The sun Temple at Modhera,The Patola textile at Paten,The amazing textile museum - Calico Museum,The old city walk,Shaking minarets, The famous Mosques and Temples, etc. National Institute of India, Indian Institute of Management,The Gandhi Ashram etc. Swati Snacks - offers best Gujarati and Indian cuisine. 'Shringar' - Amazing brass and ethnic artifacts.Textile night market at walking distance.The Grand Law Garden for morning and evening walks.Shiv Temple.CG Road the famous street for shopping lovers.Central Mall,Shopper's stop City Mall all very close by. The bus stop is only 2 minutes walk from the house and there are lots of bus options using this stop.